The essay examines Seamus Heaney’s poem “Miracle”, from his last collection Human Chain. This poem concerns the miraculous healing of the man with palsy, as described in the Gospels of St Luke and St Mark. The focus, however, is neither on the divine healer nor on the invalid, but on those who helped the sick man reach Jesus, by lowering him through a skylight in the roof. It can be considered an expression of gratitude to all those who helped the poet himself, after his debilitating stroke in 2006. The essay connects “Miracle” with other poems in which Heaney uses the imagery of “tilting” and that of opened roofs in order to express a renewed sense of wonder. Complex and stimulating at the same time, Seamus Heaney’s relationship with Classical Antiquity implies a reassessment of two key ideas in Heaney’s poetics, i.e. identity and intertextuality. It also exemplifies the poet’s need both to open a “creative” dialogue with different cultural and literary traditions and to claim his belonging to a community whose limits go well beyond those imposed by the geographical, social, and political milieu in which he lived. The Irish poet’s approach to Ovid perfectly illustrates the way he appropriates the Greek and Roman classics in order to express his “composite” identity. Thus, Heaney re-elaborates on Ovid’s themes and characters in theMetamorphoses, delving on the moments preceding the mutation and identifying with Orpheus, the master of poetry, creator and object of art at the same time. The poet also draws upon Ovid’s love poetry, offering an unprecedented re-writing of the Latin poet’s Heroides in a poem which stands as a sort of “lament of Eurydices”. Finally, Heaney reflects on Ovid’s tristiaand on his exile in Tomis, which is significantly compared to his own condition as a Northern-Irish Catholic, suffering from a form of psychological pressure (one may say, psychological exile). Thus, not only does Heaney’s encounter with Ovid bridge the gap between past and present; it also allows the Irish poet to get to a form of art which is cohesive and inclusive at the same time. A short history of the relationship between the poet, and one of his translators and other contemporary authors. A short personal portrait of Seamus Heaney focussing on the relationship between his poetry and the experience of life. 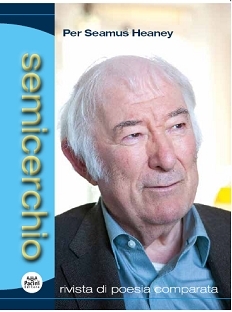 Some memories about the experience of translation from Heaney's poetry into Italian. This paper analyzes the Classical Reception in the complete works of the Polish poetess Wisława Szymborska, Nobel Prize in 1996. The first part reviews the most considerable amount of classical references which are about mythology. The second part focuses on poems whose characters and episodes are drawn from Ancient History. Another group of the lyrics analyzed presents Greek philosophers and philosophies. Finally the paper reports a list of poems containing sentences and expressions borrowed from Classical Literature. The main purpose of this essay is to investigate the influence of Walt Whitman on Stephen Vincent Benét's poetry. After a brief introduction about Benét's life and works, we will illustrate his relationship with the American literary tradition and his anachronistic romanticism in the twentieth century. Afterwards, we will investigate what Whitman's threefold influence consists in, before moving to analyse the thematic analogies between Benét's early poems of his collection Young Adventure (1918) and some of Whitman's poems. The final chapter explores the theme of friendship, common to Benét's aforementioned collection and Whitman's Calamus poems, a section of Leaves of Grass. The essay is followed by the translation of one poem by Whitman and some poems by Benét, mostly taken from Young Adventure. Milo De Angelis (1951) is one of the most important Italian living poets. In this text I approach his decades-long work throughout a double strategy. On the one side, I am attempting to underline the main characteristics of his poetry by a textual analysis and an interpretation of a famous poem (L’isola sarà guardata nella sua bellezza) taken from his masterpiece, Somiglianze. On the other, I am reporting the answers given during an interview that I made with De Angelis in 2014. This research looks at the Canadian author Glen Sorestad’s poetic exploration of Hemingway’s presence in Cuba. Sorestad transplants into five poems the essential moments and the fundamental places which characterized Hemingway’s stay in the island throughout twenty years. The goal is that of analyzing the value that till today these places have acquired to support the Cuban reception of Hemingway’s literary and biographical heritage, thus transforming him into an everlasting myth. The investigation of this cultural background also becomes a possibility, for Sorestad, of meditating upon his personal and poetic experience after two journeys to Cuba, following the American author’s track in the crucial points of his life. This research highlights, in the end, how Sorestad’s poetic project is full of suggestions taken from Derek Walcott’s Omeros, a postcolonial literary paradigm par excellence. The comparative study of specific characters and elements in both authors allows to give a wider literary space to the Cuban Hemingway’s inheritance as well as to the people in the island who continue to preserve and promote it.